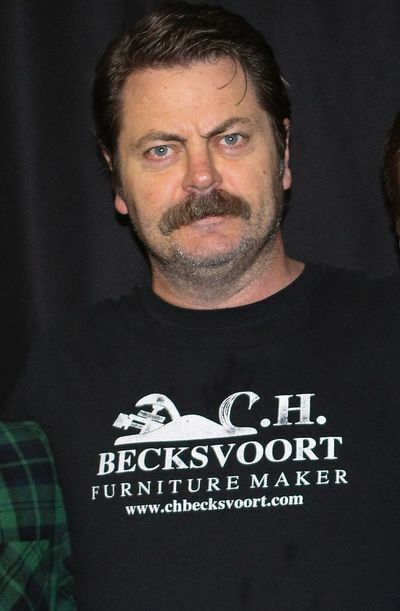 Nick Offerman (born June 26, 1970) is an American actor, writer, humorist, and carpenter widely known for his breakout role as Ron Swanson in the acclaimed NBC sitcom Parks and Recreation, for which he received the Television Critics Association Award for Individual Achievement in Comedy. Offerman was born in Joliet, Illinois, and grew up in Minooka, Illinois. He is the son of Cathy (née Roberts), a nurse, and Ric Offerman, who taught social studies at a junior high school in nearby Channahon. Offerman was raised Catholic and received a Bachelor of Fine Arts from the University of Illinois at Urbana–Champaign in 1993. That year, he and a group of fellow students co-founded the Defiant Theatre, a Chicago-based theatre company. In 2003, he married Will & Grace actress Megan Mullally and has also appeared on her talk show, The Megan Mullally Show. At the same time, he began appearing on television: as a plumber on Will & Grace during its fourth season's Thanksgiving episode, on The King of Queens, in three episodes of 24, and in an episode of The West Wing. Prior to Parks and Recreation, his most prominent role was as factory worker and Benny-Lopez-love-interest Randy McGee on George Lopez. He appeared twice on Gilmore Girls, in 2003's "The Festival of Living Art" and 2005's "Always a Godmother, Never a God". Offerman played would-be assassin of Wild Bill Hickok, Tom Mason, in an early episode of the HBO series Deadwood and in the third-season episode of Monk, "Mr. Monk and the Election" as a helper for the campaign of Natalie Teeger. In 2007, Offerman co-starred in the Comedy Central series American Body Shop. 2012 saw him in two film roles, as 21 Jump Street's Deputy Chief Hardy and in Casa de Mi Padre as DEA Agent Parker. Additionally, he starred and produced an independent film, Somebody Up There Likes Me (2012), shot in Austin, Texas. He appeared in the 2013 comedy We're the Millers, which starred Jason Sudeikis and Jennifer Aniston, and voiced Metalbeard in The Lego Movie. Offerman conceived of and starred in punk band FIDLAR's 2013 video for their song "Cocaine". Offerman also played an alcoholic college guidance counselor in Believe Me (2014). Offerman married actress Megan Mullally on September 20, 2003. They met while acting in The Berlin Circle, a play produced by the Evidence Room Theatre Company, and married after dating for 18 months. Mullally had a recurring role on Parks and Recreation as Ron Swanson's second ex-wife, Tammy. The couple have also appeared together in films such as The Kings of Summer and Smashed. He is a die hard Chicago Cubs and Chicago Bears fan. Additionally he and his wife play guitar together in their free time.